For the past week, we’ve enjoyed spring rains, some sunshine, and best of all, warmer weather! Around here, when spring arrives we all put on an extra layer of clothes and I throw open every window in the house. There is almost nothing more intoxicating for me than the feel of fresh air flowing through my home, especially after a long Canadian winter of closed windows and furnace heating. Today was one of those perfect mornings. 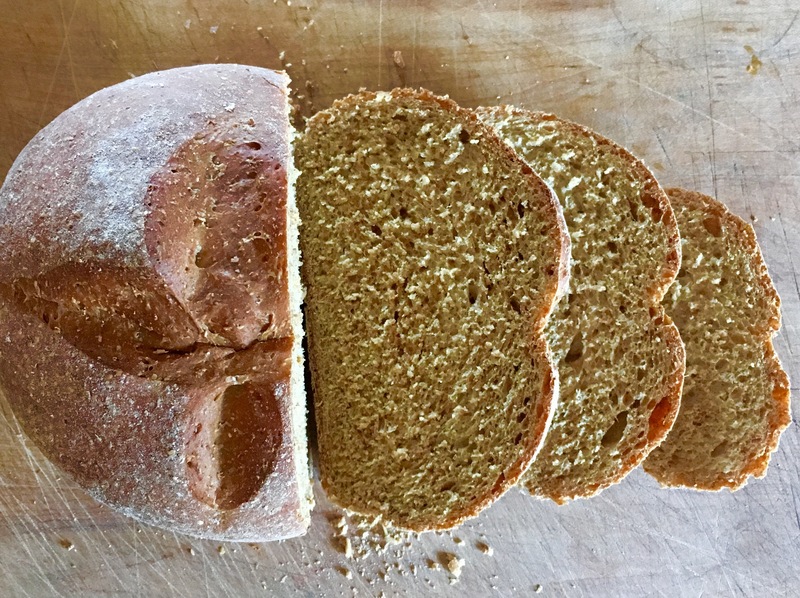 The sun was streaming through the kitchen, the windows were open, and my daughter was flying through her school work like an honour student – so I decided to spend some time in the kitchen baking bread! My husband loves brown-bread, “brown” being the term used whenever there is molasses present in the dough. I recently bought a large bag of whole wheat flour and wanted to use it, so today’s bread was 100% whole wheat “brown” bread, and I have to tell you, it’s just really, really, REALLY good bread. 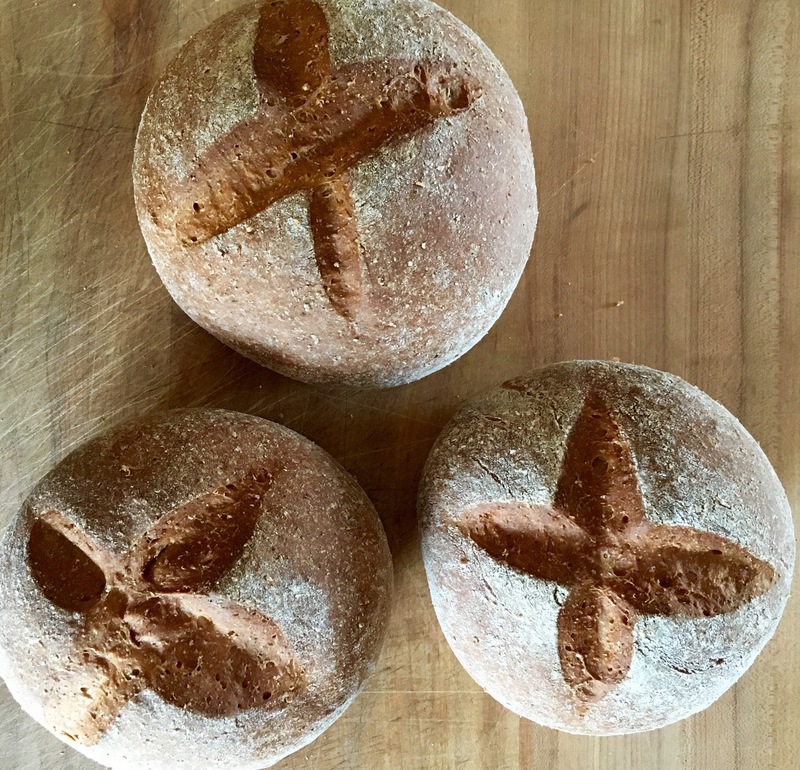 The slight bitterness of the molasses pairs perfectly with the earthy whole wheat flavours, and much like honey, molasses works to hold moisture inside, so the bread is soft, fluffy, and has a chewy crust thanks to the liberal use of olive oil. So if you wanna make some, here’s the recipe! Side-note: This bread is made in stages, and I use a Kitchen Aid mixer. It will take about 2.5 hours from start to finish, but the actual hands on work is maybe 20 minutes. 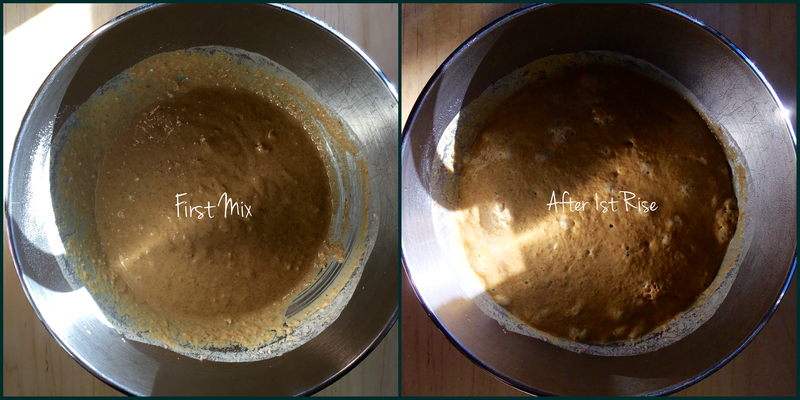 In the bowl of your mixer, pour in warm water, yeast, molasses and 2 cups of whole wheat flour. Mix well with a spoon, cover the bowl with plastic wrap and leave it alone in a warm room for 25-30 minutes, until doubled. 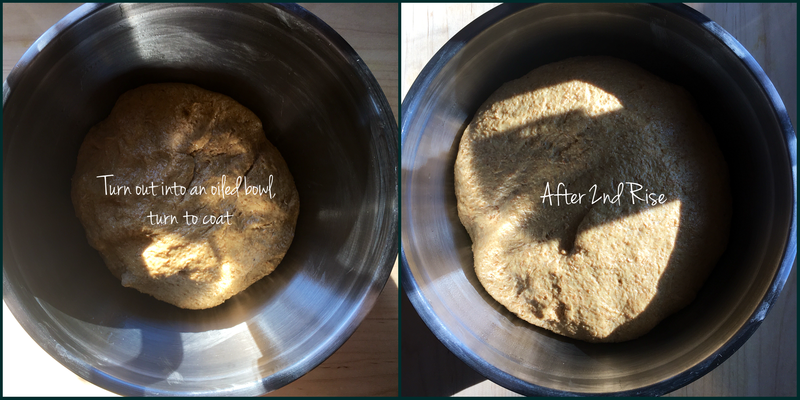 Fit your mixer with the dough hook, and add to the bowl: olive oil, salt, egg and 2 more cups of whole wheat flour. Begin mixing on low speed, and increase to medium speed once the flour is absorbed. Let it mix for about 2 minutes, it will look like a very thick batter. Add the remaining cup of flour, and mix on low speed, increasing to medium-high, for another 2-3 minutes until the dough forms a smooth and elastic ball. You may need to add a 1/2 cup of flour, or a 1/2 cup less, depending on your environment. The goal is a sticky ball that holds together and is slightly firm to the touch. Here is a little video of mine in slow motion, so you can see what it should look like. Place in a well oiled bowl, turn to coat, and then cover in plastic wrap. Let it sit for another 25-30 minutes, until doubled. I usually check my laundry at this point. So fun. Punch down the dough to release air bubbles, and turn out onto a slightly floured board. Knead the dough for a minute and the cut into 3 even sections. Roll each section by hand (shown), to form a tight ball of dough. It doesn’t matter if the bread still has flour all over it. Bread looks better all rustic and dirty. 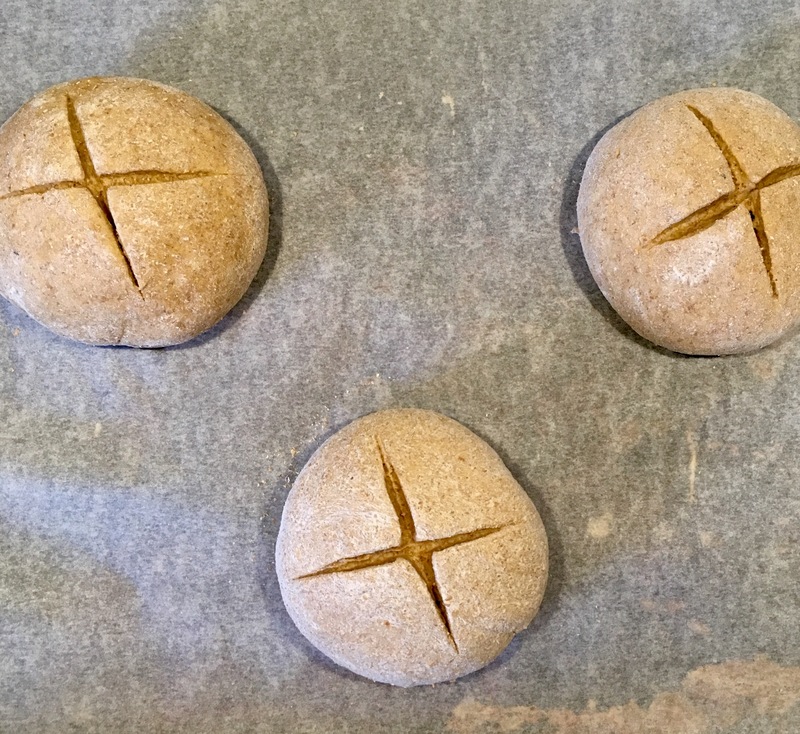 Set the loaves onto a parchment covered tray, leaving room for them to double in size. I have pretty old lady hands, for a 39 year old. Score the tops with a sharp knife, so there is room to expand and keep shape. I score mine fairly deep, about a 1/4 inch on top. Cover loosely with plastic wrap, and let it rise another 25-30 minutes. Preheat your oven to 375 at this time. Clean up your dishes and have a fresh cup of coffee! Actual fun. Bake the bread for about 30-35 minutes, turning the pan at the half way point to make sure your breads are all evenly browned. If you’re unsure of them being done (because they will puff up like giant mushroom caps), tap the loaf and listen close. If it sounds hollow, it’s done. If you aren’t sure, give it a few more minutes. I find the perfect time to cut fresh bread is about 15 minutes out of the oven. It needs a little time to rest after baking, and you should transfer the loaves to a cooling rack so the bottoms can cool as evenly as the top and sides.